Access to current evidence-informed and occupation-based knowledge, skills and behaviours is the key to using best practices in occupational therapy. 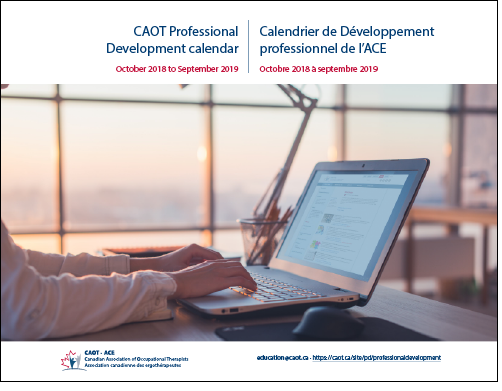 CAOT assists occupational therapists, occupational therapist assistants and students in these programs in meeting professional development needs through our series of CAOT conferences, webinars, workshops and publications. Conferences . Two- to three-day live in-person events provide you with an opportunity to learn the latest evidence and updates in a variety of occupational therapy settings, to network with other occupational therapists, to ask questions and to be inspired. CAOT members also receive discounted rates to the Occupational Therapy Australia, American Occupational Therapy Association, and Royal College of Occupational Therapists (UK) conferences. Please contact the conference coordinator of the event you wish to attend for instructions on how to receive your discount. Webinars . One-hour live presentations provide you with an affordable opportunity to receive knowledge, resources and updates on a given topic and to ask questions. Practice Evidence Webinars (formerly CAOT Lunch & Learn webinars). Evidence-informed, occupation-based and practical resources and information that occupational therapists can take away and apply in their practice. Workshops. One to three-day live in-person events provide you with in-depth, evidence-informed and occupation-based information on a given topic. Practice hands-on skills, watch demonstrations, discuss case studies, ask questions and network with other occupational therapists. Canadian Journal of Occupational Therapy (CJOT). CJOT is CAOT’s official peer-reviewed journal providing a forum for leading-edge occupational therapy scholarship that advances theory, practice, research and policy. Subscription to CJOT is included with CAOT membership. Occupational Therapy Now (OT Now). OT Now is CAOT’s practice magazine providing occupational therapists with information to meet the challenges of their day-to-day practice. Subscription to OT Now is included with CAOT membership. Publications. Assessment tools, workbooks, textbooks and other materials provide you with affordable access to in-depth information on a given topic that you can access 24/7. For your convenience, many publications are available in hard copy or eBook formats. Occupational Therapy Networks. Join fellow CAOT Members and Associates with a common goal of building capacity and network with other occupational therapists in a specific area of practice. Mentorship. Obtain personalized guidance and mentorship for your professional goals. Would you like to become a presenter or an author with CAOT? CAOT provides many opportunities to get involved ! CAOT Style Guide. CAOT’s preferred references for maintaining a consistent style in our publications and presentations. CAOT Conference Resources. Assistance for prospective abstract writers and presenters at CAOT’s annual conference. CAOT Copyright Policies. A guide to various permissions required to access and use materials owned by CAOT. CAOT Accessibility Plan. CAOT is committed to achieving barrier free accessibility for persons with disabilities for all CAOT employees, members, non-members, volunteers, contractors and key partners. CAOT Lexicon. A list of over 300 occupational therapy terms in both English and French, to provide the profession with a common language framework for communications.